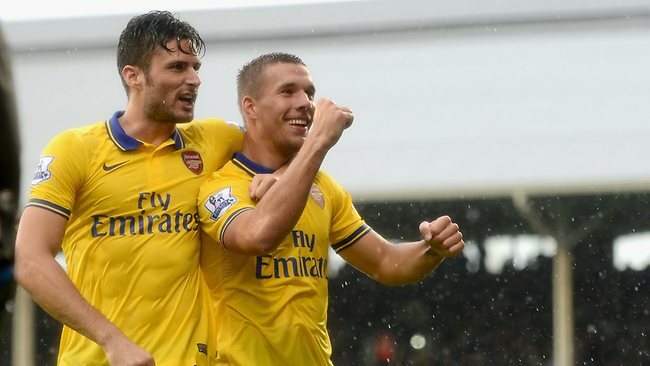 Arsenal returned to winning ways in the second gameweek of the English season, dismissing Fulham easily while there were goalless games at St James' and Goodison Park. Arsenal got their season up and running with a fine performance at Craven Cottage in Saturday's early match. Olivier Giroud scored his third in three matches and gave the Gunners the lead before Lukas Podolski doubled the lead with a rasping effort that flew in just before half time. The 29 year-old German international then secured victory for an in-crisis side before Darren Bent netted a consolation goal on his debut for the Cottagers. WTF STAT: Arsenal have never lost a game in which Lukas Podolski has scored for them. Ben Foster's heroics kept Everton at bay before he had to go off, injured. The Baggies goalkeeper saved well from Steven Pienaar and Kevin Mirallas twice and also good efforts from Marouane Fellaini, Leon Osman and teenage sensation Ross Barkley. Since Nicolas Anelka has left for the moment, Marcus Rosenborg was the only option and he couldn't convert any chances, stretching the Swede's goal drought to 29 games. 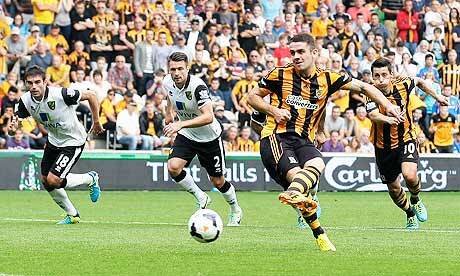 A ten-man Hull Tigers side shocked Norwich City by claiming all three points at the KC Stadium. New striker Yannick Sagbo won a penalty in the 20th minute after being tripped by Michael Turner and former Manchester United starlet Robbie Brady converted it coolly. Eight minutes later, the Sengalese striker was shown the red card for a headbutt on Canaries captain Russell Martin in an off the ball incident. 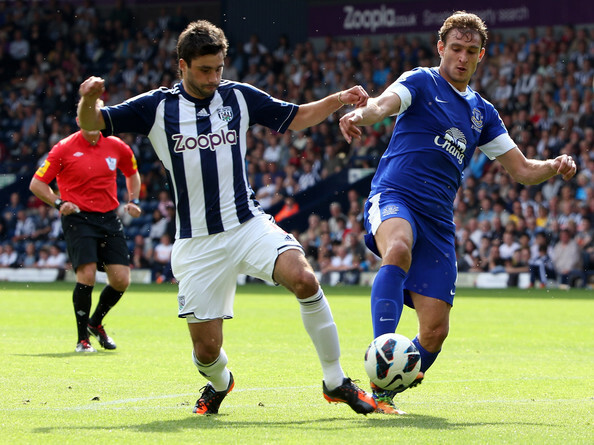 Loan signing Johan Elmander was unable to find an equaliser. 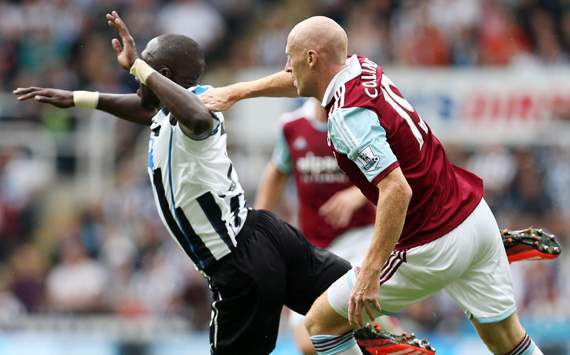 Both teams were left frustrated at the end of a tight and tense goalless draw at St James' Park. Hatem Ben Arfa was the menace for the hosts, creating a few chances as well as shooting from range himself. Winston Reid almost scored an own goal for the visitors before going close at the other end in the second half. Former Magpies boss Sam Allardyce was left unhappy as his side had better chances but they were lucky to survive Yoan Gouffran's late effort. Jose Fonte rescued a point for a rejuvenated Southampton side late on at St Mary's. It was a first point of the season for Paolo di Canio's Sunderland but it could have been all three points in the bag after Italian summer signing Emanuele Giaccharini's second minute headed goal. Jay Rodriguez had an equaliser wrongly ruled offside and Sunderland began to absorb some pressure from the Saints and England hero Rickie Lambert wasted several chances. In the end, it was a fair result to say the least but Southampton could have won it. A second half revival from Stoke denied Premier League newcomers Crystal Palace their first points of the season. Marouane Chamakh's 31st minute strike put the visitors ahead but Ian Holloway's side only led for 27 minutes before Charlie Adam slotted in to equalise. Just four minutes later, centre-back Ryan Shawcross was celebrating as he gave his team the lead, and ultimately Mark Hughes' first win as manager of the Potters. Liverpool rose to second place in the Barclays Premier League with a narrow win over Aston Villa at Villa Park to maintain their 100% start to the season. The visitors were on top of the game for much of the game but faltered a bit in the second half and had to maintain some Aston Villa pressure for an equaliser late on. Simon Mignolet made some great saves from Christian Benteke and it was those saves that won the game for Liverpool, just like last weeks heroics from the Belgian international. Both teams had penalty appeals ignored late on and Paul Lambert's side came out after the break slightly stronger, but Daniel Sturridge's eighth goal in seven games won the match for the Merseysiders. Liverpool are now unbeaten in 10 games, a run that started with this exact result, a win at Villa Park. Cardiff produced possibly the biggest shock there will be this season as they came together to come back and beat Manuel Pellegrini's Manchester City. The visitors silenced the loud home support in the 52nd minute as Edin Dzeko's shot flew past the defence and goalkeeper Marshall. Cardiff equalised on the hour as Aron Gunnarsson smashed in a rebound from Fraizer Campbell's stopped shot. They then took the lead after 15 minutes of defencive play through former Sunderland man Fraizer Campbell. The striker doubled his tally just eight minutes later to signal the start of the party for Cardiff fans who went bezerk. Alvaro Negredo almost stopped their celebartions though, as he scored a late goal in the 92nd minute but the Citizens were unable to level again. It was a remarkable match which looked like it was impossible to pick a winner but Cardiff's mentality was certainly shown today and if they do that all season, they may be here for a few more. The Bluebirds are now 10th while Manchester City are in sixth position, one higher than Manchester United who have a game in hand. Roberto Soldado scored Tottenham's winner through a penalty once again as they overcame a stern test from Michael Laudrup's Swansea side. It was the £26m man's fourth goal in three games for Spurs, who now rise to 3rd in the Premier League table, behind Liverpool and Chelsea. Jonjo Shelvey brought down Andros Townsend to gift the home side a chance after Ashley Williams twice denied a goal for Paulinho. Swansea applied some late pressure and Hugo Lloris had to work hard to stop a Chico volley at the death. It had been billed as the game which would decide who would get bragging rights early on in the season. Chelsea, under the always unpredictable phenomenon that is Jose Mourinho, and Manchester United's first home game under David Moyes in the Barclays Premier League. Many were excited, a packed stadium, tension running high. A goalfest surely? No chance. It was one of the most boring games I have witnessed in recent times, the last one was probably this fixture in the FA Cup final 2007. Wayne Rooney, the man running everyone's minds was the star performer, bringing out a flying save from Petr Cech from a good 30 yards out while United also had a penalty shout when Cleverley's touch struck Frank Lampard on the arm. I think he was too close to react quick enough. Also Mourinho's decision to not play Juan Mata at all was astounding considering he has been the thorn in United's defence every time he plays them. Both teams were playing for a draw and it could be seen, both defence's on top of the attackers. I think the champions would have deserved the win if I had to say, as Robin van Persie had a powerful volley blocked away as well. League leaders Monaco were held to a goalless draw on Friday by Toulouse. Falcao missed several chances to score for the hosts while Toulouse had a couple of close calls. On Saturday, Lyon were shocked by Reims, losing 1-0 while there were wins for Marseille, Bordeaux, Montpellier, Guingamp and ETG. Lille defeated St Etienne 1-0 on Sunday while Ajaccio and Nice held each other to a goalless draw. Marseille are now top of the table, extending their 100% record to go 2 points clear at the summit. Monaco, Lyon and St Etienne complete the top four while champions PSG are now up to eighth after Ezequiel Lavezzi's late winner gave Laurent Blanc his first win in Ligue 1. Borussia Dortmund's 1-0 win over Werder Bremen kicked off the third gameweek of the new Bundesliga season. It put them on top of the table ahead of the weekend when Bayern Munich, Bayer Leverkusen and Mainz all joined them at the top of the tree with respective wins over Nuremberg, Borussia Monchengladbach and Wolfsburg on Saturday. Hannover produced a surprise by beating Schalke 2-1 while HSC Berlin continued their good form by defeating Hamburg 1-0. There was a goalfest In Hoffenheim as they drew 3-3 with Freiburg. Earlier today, Eintracht Braunschweig were humbled on their own turf by bottom side Eintracht Frankfurt 0-2 meaning they climb up to 11th place. Augsburg defeated Stuttgart 2-1 comfortably at home on Sunday. Verona kicked off the new Serie A season with a 2-1 shock win over giants AC Milan. Juventus also got their season under way with a decent 1-0 win away at Sampdoria. There was just one draw, a goalless one, between Parma and Chievo while there were wins for Lazio and Cagliari over Udinese and Atlanta respectively. The biggest victories came for Roma, who beat Livorno 2-0, Torino with a 2-0 victory over Sassuolo and Napoli went right to the top of the table with an astonishing 3-0 demolition of Bologna in Rafa Benitez's first Serie A game.